93. The Kathy Laugh. Haw Haw Haw Haw. #93. The Kathy Laugh. Haw Haw Haw Haw. Kathy Vavrick-O'Brien. The queen of the distinct laugh. Every time I used Kathy in one of my stories (or one of my Fallen Comrades parodies), I always made her laugh as much as possible. And I did this mainly because I always wanted to use that distinctive laugh. 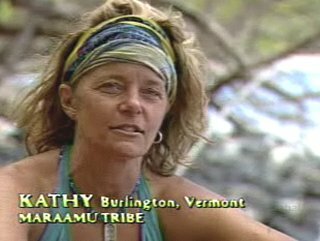 Kathy's best trait as a Survivor character was the fact that she always explained her thoughts to the camera. She never hid things from us, she was 100% open and honest in her interviews, and she gave us full access to whatever she was thinking and feeling every single minute of the game. 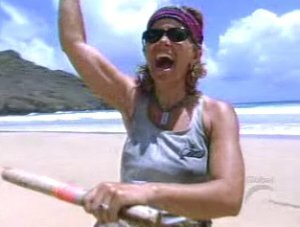 And for that reason, I think she was one of the best Survivor characters of all time. She was always honest, she was always analytical, and she was just emotional enough to make her sound like an actual human being. In short, she was everything you could really ask for in a player. But best of all, Kathy had the most wonderfully distinct laugh. You could hear it in the background of just about every scene, and it was identifiable every single time she thought something was funny. Because like all good laughers throughout history, Kathy laughed all the way down from her diaphragm. And it was always a joy and a pleasure to hear. 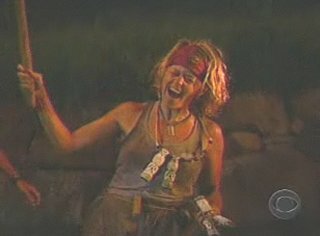 So thanks Kathy, for giving us the single best laugh in Survivor history. "Yeeee haw! Haw haw haw haw!"